Toluca Lane is a family owned boutique grape growing and wine operation in Yamhill County that produces about 300 cases of wine. Our philosophy is to make intense, handcrafted Pinot Noir in a Burgundian-fashion. In order to achieve this intensity, we drop over half of our fruit to 8 clusters or less per vine. This yields an average of less than 2 tons per acre thus concentrating the remaining fruit. We purchased our 5-acre parcel in 1997. At that time it was solid pine trees with plenty of blackberry bushes growing up and through the trees. We cleared the land and slowly established 2 small vineyards of Pinot Noir. Our dream 20 years ago was to make a quality, sophisticated Pinot Noir. Pinot Noir is affectionately referred to as “the heartbreak grape”. We have come to understand how it has earned this reputation. It is a fussy little grape with thin skins and wants to be treated genteelly like a porcelain doll. We left everything for our dream -- California , the big city life, family and friends. We love it here and we love making Pinot Noir that family and friends can enjoy. 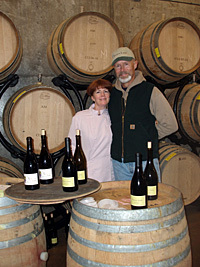 We have happily been producing and selling our Pinot Noir since the 2002 vintage.